In answer to your poll, I remember using “Brylcreem — A Little Dab’ll Do Ya!” for the popular greasy hair look during high school and college. 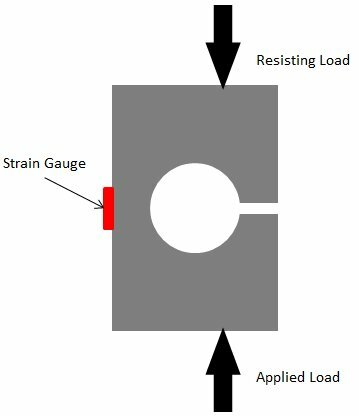 Question: How do you go about calibrating load cells for the extremely high forces that are to be measured on your test stand? @Steve: Good question, as usual. There is a two-phase answer to your question. I know the answer to the first part. The answer to the second part will require some research on my part. The first part is this: How are the three vertical load cells on stand A-2 calibrated? This is a good question because they’re not easy to get in and out of the test stand. Matt Strickland is the helpful gentleman who took the photos of the test stand components for the last two blog articles and he had to do some crawling around to get to the load cells. They’re deeply embedded in the structure of the stand. So, you would not want to have to pull these things out and calibrate them off of the test stand very often. Instead, we have a calibration system built directly into the stand. The calibration arrangement involves a hydraulic ram and a single calibration load cell. The hydraulic ram is built into the structure so that it applies a load to the platform and the load measured by the three vertical load cells is compared to the load measured by the calibration cell. You can do this calibration test with the engine removed, with the engine installed, and with the engine install and cryogenic propellant loaded. 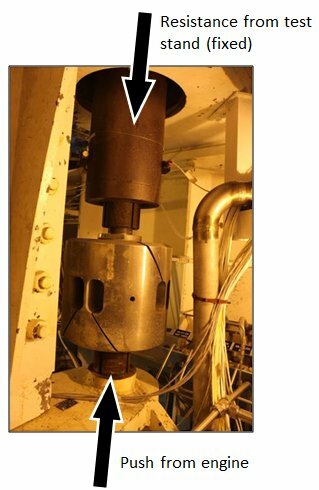 In this way, you can not only calibrate the load cells by comparison to the calibration cell; you can also get a measure of the tares resulting from engine installation and the impacts of the cryogenics on the feed system. The calibration of the vertical load cells is then tracked over time to make sure that they remain reasonably consistent. 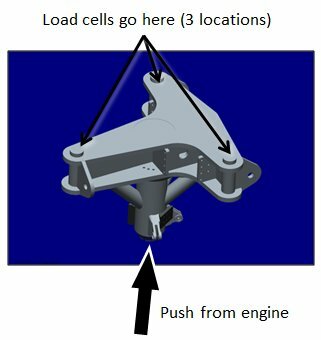 If a calibration point for a cell starts deviating, it might be due to a failure in the cell, or it might have to do with a change in the test stand configuration. I remember years ago we saw something odd in the measured thrust data that kicked off a minor investigation. It turned out that a technician had welded a small, rigid line to the thrust platform no realizing that this massive structure is actually supposed to “float” free of such encumbrances. It’s kind of like holding onto something when you step on the bathroom scale. You’re interfering with the function. The welded line was removed and all went back to normal. Now, the second part of the answer to your question is this: How is the calibration cell calibrated? It is, after all, the referee for the whole system. The answer is that we hand it over to a calibration lab and they take care of it. Yes, unsatisfactory answer. I honestly don’t know how they apply a controlled load to the cell. Do they stack a bunch of weight on it? Do they use less weight but a lever system? Or, do they apply a controlled load hydraulically somehow? It’s a lot of load, upwards of a million pounds, so it involves some thought. I will ask around and see what I can dig up. @ Steve: After a bit of poking around and talking to people, it would seem that the answer as to the question “How do you calibrate a calibration load cell?” is to use another, “gold standard” calibrated load cell. And so I asked, “Okay, but how do you calibrate the ‘gold standard’?” Well, by another standard one. Duh. And so on. This was not a pleasing or sufficient answer. The whole thing was starting to get a bit like the chicken-or-the-egg paradox. Finally, though, it became apparent with a little research that the ultimate answer – the egg before the first chicken – is that calibration is done in a lab using a deadweight machine. What’s that? Well, it’s a machine that actually loads weight onto the load cell. Yes, that much. Lots and lots of weight. And, in terms of precision, they take into account local variations in the Earth’s gravity field and even buoyancy of the weights in air in their calibration procedures. According to the National Institute of Standards and Technology website, and some of the reference material that they cite, they can go up to 1,000,000 pounds-force using these deadweight machines, in increments of 50,000. Have you ever used a machine in the gym with a built-in weight stack? Their description kind of makes me think of something like that but on a much, much larger scale. That’s pretty cool. Note that for calibrations over 1,000,000 pounds-force they revert to using a series of deadweight-calibrated load cells and, I assume, a hydraulic ram. They said that they can go up to 12,000,000 pounds-force. Now, if I ran NASA, I’d take that as a challenge to build a rocket engine that goes right up to the limit. And that, right there, is a clear illustration why we shouldn’t let rocket guys like me run the agency! We’re all a little nuts. Thanks for the question that prompted me to go off and learn something new. Truly, no day is wasted in which you learn something new. 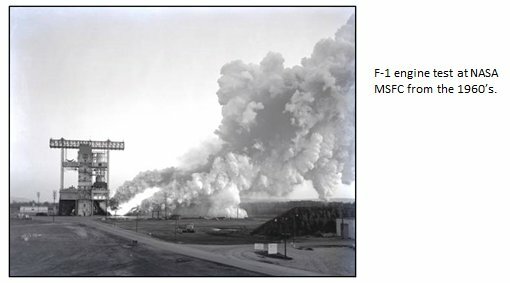 Didn’t NASA get close to that 12,000,000 pound force when they were testing all 5 F-1 engines at once for the Saturn rocket? The Saturn V vehicle first stage had five F-1 engines. Each engine put out 1.5 millions pounds-force thrust. That’s a total of 7.5 million pounds-force. So, yes, that’s getting up there. I’ve been told that back when they tested these stages locally, they’d inform the entire region of North Alabama so that nobody would panic and assume that it was an earthquake. The tests would rattle windows throughout the county. I know this is getting quite off topic. My apologies. The SLS heavy lift rocket will eventually be designed to lift 130 tons (plus itself). That’s an incredible amount of weight to lift off of earth. How many millions of pounds-force thrust do you believe will be needed to get this massive rocket off the ground? 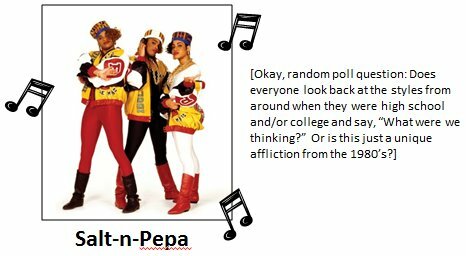 And, I hope this question isn’t too dumb. But, what is the difference between a rocket engine and a rocket booster? Thank you for taking the time to answer all these questions and making “rocket science” so interesting!! The Saturn V vehicle weighed about 6.5 million pounds sitting on the pad before liftoff. The thrust necessary to get that moving was on the order of 7.5 million pounds-force, i.e., five F-1 engines at 1.5 million pounds-force each. The final configuration for the ultimate SLS Block 2 vehicle is not entirely resolved. There remains the open issue of whether the boosters are to be solid or liquid propellant. At the most extreme, it would seem that the weight of the vehicle on the pad could be as much as 7.5 million pounds. That would mean the liftoff thrust has to be better than 8.5 million pounds-force. Again, these are the biggest numbers that I’ve seen. Some variations show slightly lower numbers. Now, “booster” versus “engine”… I’ve illustrated in the blog what we typically think of as a “rocket engine.” It uses liquid propellants and it generates its own pumping power to pull in the propellants and generate thrust. The term “booster” is used a bit more loosely. We often refer to the large solid-propellant rockets on the sides of Space Shuttle stack as boosters but there are SLS vehicle options where these boosters are replaced with liquid propellant boosters propelled by liquid propellant rocket engines. So, “booster” is more of a generic term for a first stage, oomph-off-the-pad stage that could be either solid or liquid propellant. NASA removed J-2X engine No. 10001 from the A-2 Test Stand in early October. Can you tell me the date(s) it was removed. Also if possible Lagniappe article on Blue Origin firing gave no date and I asked for it also with no response. Can you provide? Please keep up the excellent Blog installments! I find them extremely interesting and informative and look forward to each and every one. Facinating reading and very, very good Blogging! You sir, are a natural! I find the develpoment of the J-2X endlessly interesting and educational. Please more! Thank you! – Jeffery Skinner (spaceflight nerd).